COLLEEN PATRICK-GOUDREAU is a powerhouse who needs little introduction. 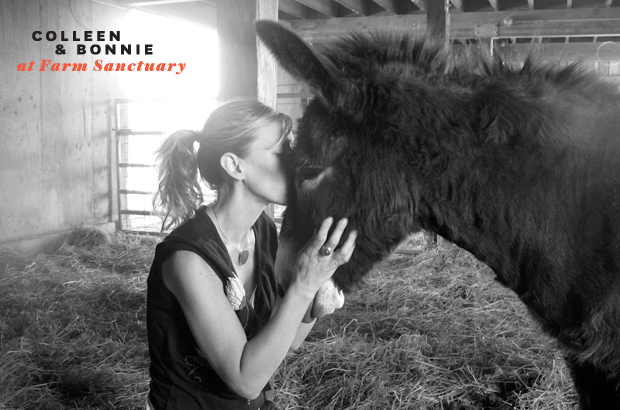 She is an animal advocate, chef, writer and speaker. In short, a doer. The author of six books , she regularly lectures around the country, inspiring others to think and act more compassionately. She is the creator of the 30-Day Vegan Challenge, an innovative program that has motivated many people to rethink and change their lifestyles. Her approach to advocacy is pretty straightforward. “My intention really is to take “veganism” out of the box and inspire people to recognize that it’s not some crazy, unfamiliar philosophy of living. It’s just common sense,” she says. We couldn’t agree more. 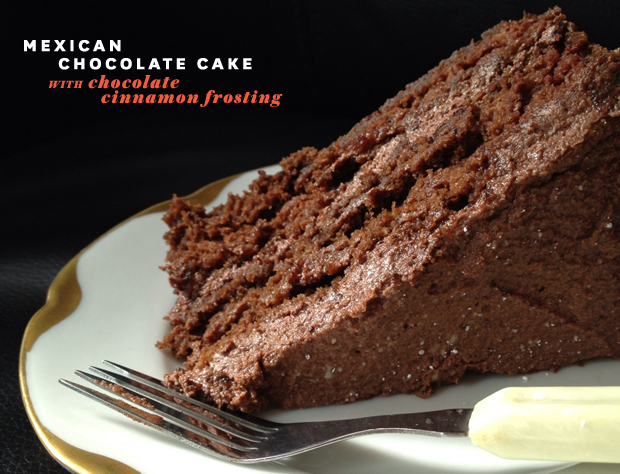 Here, she brings us a one-of-a-kind recipe for a cake with aphrodisiac qualities— to spoil yourself or the one you love with (…did you know that cayenne pepper contains capsaicin, which raises endorphin levels?) And being the gold mine of information that Colleen is, we also couldn’t resist picking her brain for some food for thought. Read our insightful Q&A with Colleen, immediately following the recipe. the spicy cayenne pepper and sweet cinnamon. Pair with a nondairy vanilla ice cream, and book a flight to heaven. Preheat the oven to 350 degrees F. Lightly oil two 8-­inch (round or square) cake pans, or prepare cupcake/muffin tins with paper liners or silicon cups. In a large mixing bowl, combine the flour, cocoa powder, baking soda, cayenne pepper, cinnamon, salt, and sugar. In a separate bowl, beat together the applesauce, oil, vanilla extract, milk, and vinegar. Add the wet mixture to the dry ingredients, and mix until everything is thoroughly combined. It will be a bit of a thick batter. Although it can be done by hand, it’s easier to mix using an electric hand mixer. Cream together all the ingredients on low speed until smooth. Increase the speed once all the ingredients are combined, and you don’t risk powdered sugar flying everywhere. Increase the speed even more until the frosting is light and fluffy (about 3 minutes). Add an additional l or 2 tablespoons of milk, if necessary. Lick the spoon, and frost your cake! Yield: Enough for one layer cake or 18 cupcakes. Soy-­free (if using soy-­free Earth Balance and milk), tree-­nut-­free, peanut-­free. Tell us a bit about the creative process involved in developing your recipes. I’m always aware of my end goal, my intention of what I want that recipe to be by the time I’m ready to offer it to the world. Because everything I do is for advocacy, I’m always thinking of the recipient of the recipe rather than the pleasure I derive from concocting it. In other words, when I was writing The Joy of Vegan Baking, it was all about creating recipes that were as accessible and familiar and that would inspire someone to say, “Oh, this is a delicious cookie! It’s not a ‘vegan’ cookie; it’s a delicious cookie that happens to be vegan.” The end result was about helping people realize that there’s no deprivation in living vegan; it just requires undoing a few habits and learning new ones. With the recipes in Color Me Vegan, which are broken up in the book by their color, I didn’t want people to have recipes full of exotic ingredients just because they would yield a certain color. I wanted the recipes to be nutrient-dense and pop with color but still be familiar enough that people wouldn’t have to fly something in from Brazil to make one of the recipes. The cayenne and cocoa in the Mexican Chocolate Cake is simply the result of one of my favorite flavor combinations, and they both happen to be ingredients that can be considered aphrodisiacal – cocoa because of the chemicals in it that mimic the feelings we get when we’re in love and cayenne because of the heat they create in our bodies and how they open up our blood vessels, enabling our blood to flow more freely – to all of our organs. So are aphrodisiac foods something that can integrated into the daily routine? Have to agree with you there. Any insider baking tips you could offer? I always say that baking isn’t about animal-based butter, dairy, and eggs. It’s about binding, moisture, leavening, and fat. Again, it goes back to that end result I was talking about before. When people realize what the foundation is, then they become empowered to create that foundation with ingredients they never thought of before. So, your combination basically fulfills the need for moisture and fat, which is why it works so well. You’re a very well-versed, compelling advocate for animals. When do you think you found your voice? The only thing that’s going to change our treatment of animals is a shift in our perception of animals and our relationship to them. When the macro paradigm shifts from “animals are here for us to use, and my desire for convenience and pleasure supersedes their right to not be exploited and killed” to one that sees animals as fellow beings and cohabitants worthy of our compassion, then things will change on a fundamental level. The current treatment of animals as tools, machines, and objects is simply the physical manifestation of a paradigm that sees animals as ours to possess and use. We have to shift the paradigm, or nothing will ever change. I’ve been clear about that for a long time, and it pretty much drives and dictates my message. When people are tuned into their compassion, they act from it, and their paradigm shifts. So, I see my job as shining the light on the compassion that already exists in them to enable them to have that paradigm shift. I’ve always seen my advocacy role as a guide – giving people what they want – rather than as someone that dictates what should be done. So, over the years as I was trying to find my place and my contribution, I just kept asking the questions: “What am I good at?” and “What do people need?” and I kept finding the answers. It’s not about me; it’s about giving people what they need to make it possible to make the changes I know they want to make. So, I taught cooking classes and wrote cookbooks to give them the recipes they need to make delicious food; I started producing a podcast to answer all the questions people have about the social aspects, ethical aspects, and nutritional aspects of living vegan; I launched The 30-Day Vegan Challenge to guide people to making these changes confidently, healthfully, and joyfully. My present and subsequent projects will continue to be driven by “what tools do people need to make the changes that will reflect their values of compassion and kindness?” As long as I can fill that gap, I’ll do it. Why did you choose the duration of 30 days for your 30 Day Vegan Challenge? And what kind of response have you seen to the program? The philosophy/strategy behind 30 days is that it takes 3 weeks to change a habit, though I like the extra week to make sure I’m addressing every question people have. Most people say “they don’t eat a lot of meat, dairy, and eggs,” and yet the truth is you don’t know how much you eat until you stop. So, I’m just saying, “look, do it for 30 days, and in that time, I’ll give you everything you need and address every challenge you have.” I don’t care WHY people come to the Challenge. It doesn’t matter. But throughout it, I give people everything they need so that by the end of the 30 days, they have a strong foundation on which to stand – and continue. The response to the Challenge has been exactly what I’d hope it would be. By the end of the 30 days, many people have experienced measurable differences in their numbers (lowered cholesterol, blood pressure, etc), but many tell me about how its changed the lens through which they see the world. It doesn’t get any better than that. Are you more encouraged about our society embracing “unconditional compassion” as you’ve called it, today than you were when you started Compassionate Cook? Any future plans you’d like to share with us, any big-picture dreams? I knew 13 years ago when I first started my work that people would respond to the message of compassion, and I’m even more convinced today because I see the results through the thousands of emails I’ve received from people whose hearts have become awakened to their compassion. People aren’t more compassionate today than they were 13 years ago or 50 years ago, but there are more tools available with which we can get the message out to reach more people. My future plans and big-picture dreams are to do everything I can to reach as wide an audience as possible, using every tool and medium available to me. For me, the question isn’t “what’s the most effective message that people respond to?” I already know that answer; it’s compassion. The question is “how can I reach more people with this message?” Wherever that answer lies, that’s where you’ll find me. Learn more about Colleen’s advocacy at Compassionate Cook and The 30-Day Vegan Challenge. 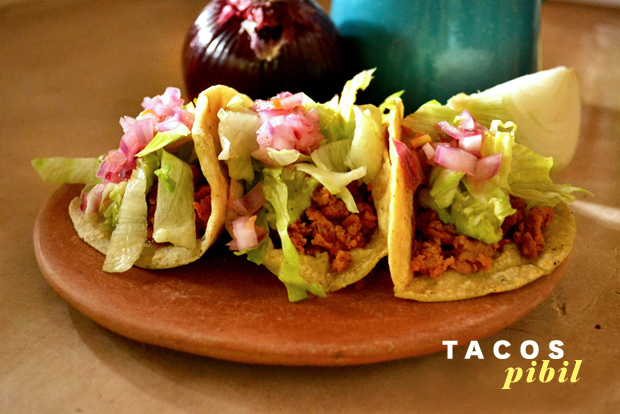 A RECENT VISIT TO TULUM, MEXICO uncovered the Mexican restaurant of our dreams. 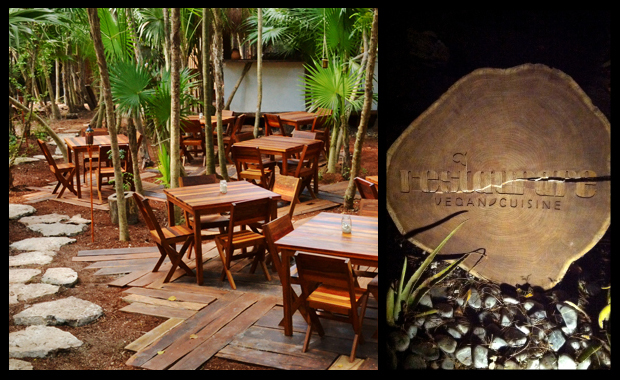 So discretely tucked away off the main road that even a local taxi driver had difficulty finding it, the beautifully-designed open air Restaurare felt like an oasis of creative vegan Mexican food. It’s no wonder that the restaurant’s name is inspired by the philosophy of restoring the spirit. Chef Karla Madrazo’s and her partner Roberto Mattocks’s vision for a restaurant was one with as little environmental impact as possible, and one that respected animals and humans. “The goal is to give vegetarians, vegan or anybody, the chance to know and taste delicious Mexican food, but consciously and happily,” explains Karla. The Chef’s talents are evidenced in thoughtful dishes that combine tradition and innovation—a result of inheriting her mother’s cooking secrets and a modern education at culinary school. “I grew up with a mother so good at cooking Mexican food that I just have it in my cells,” Karla tells us. Mix everything together in a pot and put on high heat. When it is boiling add the texturized soy, integrate really well with a spoon and turn off the heat. Tip: If you can’t find ‘recado rojo,’ try finding achiote— a red paste that mayans used to put on their faces during rituals. You can mix it with dry oregano, onion, garlic, black pepper and salt and make your own recado rojo! Cut the red onion into small cubes or ‘brunoise’, add the juice from limes salt and pepper. Cut the habanero chili really small and put it in. At the beginning it will be spicy but with time you’ll start to feel it is less spicy. Correct seasoning if needed. Put everything in a pressure pot and cook as you usually do. I like to leave the water for beans a little bit salty so when cooked it’s flavorful (the water has to taste with a hint of saltiness). When they’re cooked, process the beans with some of the cooking liquid and the spread is ready! Tip: if you want the spread even more flavorful try sautéing white onion and garlic (chopped), add the processed beans and correct seasoning. To start, spread a tablespoon of the black beans on the tortilla, then 2 tablespoons of the pibil soy. Top it with lettuce, alfalfa sprouts and xnipek on top. Try keeping everything in the middle so as you’re plating it looks neater, and serve. The vinaigrette is really easy: we’re making an emulsion from the acidity of the lime and the oil from coconut. Mix the lime juice with the Dijon mustard, chia seeds, salt and pepper (still you will have to correct seasoning at the end, depending on the ingredients). Whisk really well before adding the oil until you see it starts to make a few bubbles. Then, start adding the coconut oil slowly so it can integrate while you keep whisking. 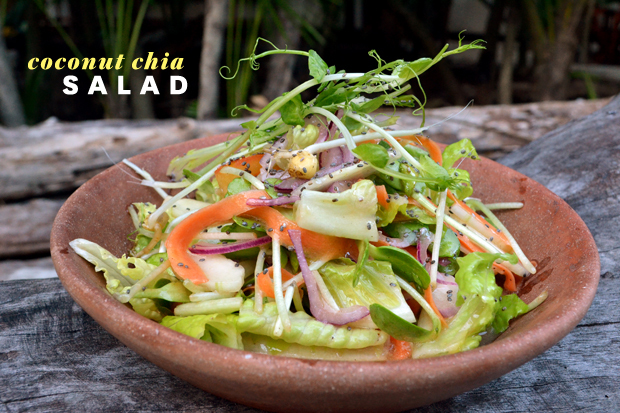 Ingredients change from one place to another so maybe you’ll need more lime or more coconut oil but the taste has to be a little bit salty so when mixed with the salad it is still flavorful. Try to get a crispy cucumber, a sweet tomato, a powerful red onion and limes with a lot of juice. Choose the ingredients you like the most for the salad, we chose these because they’re local, fresh and tasty, toss them with your homemade vinaigrette and enjoy! Tip: you can try other vinaigrettes with the same principle of getting and acidic ingredient and any type of oil. JUSTIN BUA is a celebrated artist, with a best-selling collection of fine-art posters and a loyal, international fan base (over 27,000 likes on his Facebook page at last count!). 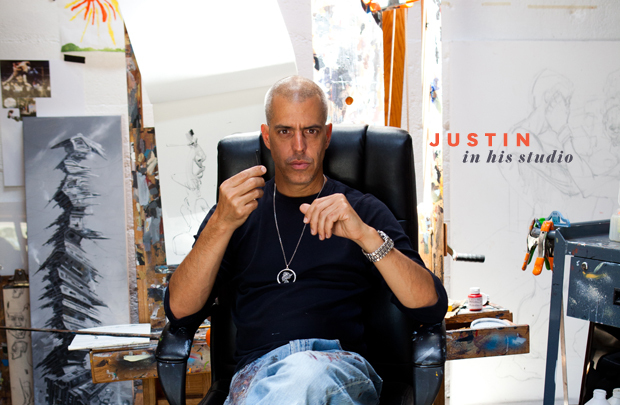 His dynamic, intricate paintings have been displayed in solo shows at fine art institutions like LACMA (Los Angeles County Museum of Art ), and are in the private collections of the likes of Kareem Abdul-Jabbar, Eva Longoria and Christina Ricci. “Bua’s stylish renderings jump right at you, hit you between the eyes with their energy,” is how author Elmore Leonard once described his work. 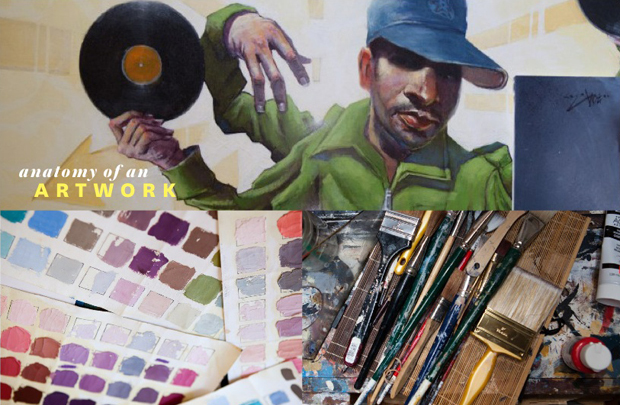 Justin’s illustrated books— “The Beat of Urban Art”- a visual journey through Justin’s youth in New York; and “The Legends of Hip Hop” – an homage to some of the biggest names in hip hop— are already considered classics. 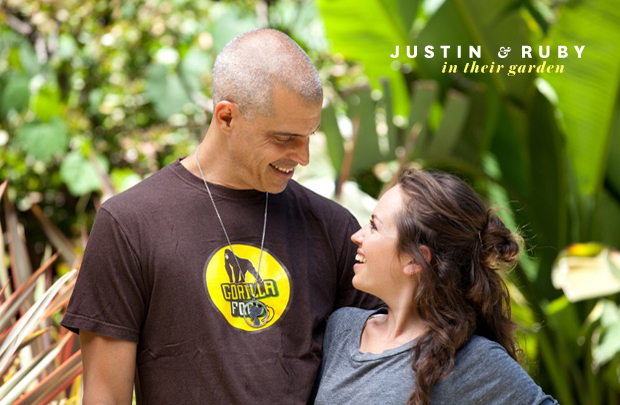 “Any opportunity I have, I draw,” says Justin. Indeed, if you follow him on Instagram, you are treated to a stream of new artwork- uploaded daily, sometimes multiple times a day. His nurturing rapport with his artistic young fans is inspiring. Having once been a professor at University of Southern California for 12 years, his upcoming art venture is a fitting return to his roots. Here, he gives us an exclusive glimpse and talks about his busy life. Tell us about BUA University. I have an online University that I’m going to be doing. I am pretty excited about that! I will be teaching 150 classes online. It’s going to be an amazing situation where I could kind of just go off… more than teaching, it’s a little bit more “edutainment”- fun and fantastic. You can download classes whenever, and it’s for all ages and levels. It’s interactive- if you do work that you want to show me, you shoot it off, I download it and provide a critique. The site will go live this summer. Wow, sounds incredible! Talk about your art process a bit. I work in a really old-school kind of way: I work the drawing up with thumbnails, and then I move to finished line drawing, then move to value keys, and then I move to color keys. Value keys tell me what my darkest dark and my lightest light is. Color keys which tells me the temperature, the time of day- is it sunny? is it overcast? is it sunset? I just keep working like that until I figure it out. It’s a very laborious kind of process. But I have to do it, since most of the time I’m not just doing portraits, I’m usually doing a whole scene, I’m creating an entire world and a place. It can take anywhere from a day to a couple of weeks, depending on the project. I have contemporary heroes like Ralph Steadman. And then I love Rembrandt. Rembrandt is one of my all-time favorites. Daumier is another one. George Bellows. I love Picasso, because he was such a crazy artist, and you really feel the love and spirit of what he does. I love a lot of graffiti writers—a tremendous art form. Saber is really great, a good friend of mine. Your food choices must play a role in your hectic schedule. What does veganism mean to you? I grew up on all the acronyms you could think of- McD, KFC, MSG. As I started to investigate and read Eric Schlosser’s “Fast Food Nation,” or John Robbins’ “Diet for a New America” or Howard Lyman’s ‘Mad Cowboy,” I started to feel like- wow, I was really kind of bamboozled! I felt like there was a certain hoax and poisonous lie that was permeating the reality that I was living. I almost felt angry, I thought, “this is insane.” I thought, “I’m angry, I’m not going to take it anymore. I’m going to DO something proactive”- which is really what veganism is. So- I’m not going to buy your steroid-antibiotic-poisonous-slaughtered-meat. But I’m rather going to support my local farmer, who is making a decent wage, who is growing food that is not harming the environment, not killing animals and it’s holistically better. A friend of mine is an ex-Arizona State linebacker. I work out hard- I’ll turn up the volume, work out for two hours… functional strength, Crossfit, circuit training. And he’s like, “I’ve never meant anybody like you, I thought all vegans were kind of like “new age, woo woo, pretentious, privileged people.” Because a lot of people have that perception. So some may be surprised by the connection between veganism and a counter-cultural art form like hip hop. Can you explain? The real vegan story comes from the same place that the real hip hop story comes from, which is- “I’m going to look into what’s going on with the system, I’m going to evaluate it, I’m going to investigate it, and then I’m going to do something about it. And change it.” If you really look back at people like Afrika Bambaataa- he was the guy who was promoting veganism and vegetarianism, and if you ate pork, you would get beat down. Before I was even learning about it, kids like my friend Mr. Wiggles from the Rock Steady Crew, was already hip to veganism because of Bambaataa. Real hip hop is counter-cultural, it’s always been a counter-cultural movement- like jazz. It started from the streets, it started as a means to communicate what was going on in New York City. It was street poetry about some of the social injustices of the world. It was about speaking what was really on your mind, because it came from a true place. And veganism in a lot of ways is: we’re not going to buy into what you are trying to sell us. We’re going to talk about it. We’re going to actually really believe in something that’s real. You and your partner—fellow artist, vegan and author Ruby Roth—have a garden at your home in LA. You also helped build a farm in Hawaii? Noniland is the farm that I helped build in Kaui. Because of my green thumb, I taught [health guru] David Wolfe how to farm it. He was a bit naïve about how to plant trees—cacao trees in particular, because they need a lot of shade. He thought they needed to be in direct sunlight. His lack of knowledge about tree planting was so ironic, because he’s a genius botanist and super food guru but when it comes to gardening he’s a bit of a grass-assin nincompoop. However after a few days with me, he got on track! Clearly, you and David are good friends. You even created a drink mix together? Yes, it’s called “Immortal Machine,” and it has some of the best super foods ever like Cacao, Hemp, Lucuma, Maca and Ashwaganda. It tastes like Nestle Quick, but it’s all raw vegan and organic—might be the best drink mix ever! You are not only a dietary vegan, but an ethical one as well. What is your view on fur- the sale of which was recently banned in West Hollywood? Beautiful animals are tortured and murdered for their skin. So sad. If anyone in their right mind saw how they get fur, they wouldn’t wear fur. Its an evil industry. And to get the latest news on BUA University, follow Justin on Instagram. Photographs of Justin Bua, Ruby Roth and their studio by Colin Hornett, exclusively for Laika Magazine.